Earlier this year I wrote about some technological changes here. One commenter suggested I share a picture of my current set up. 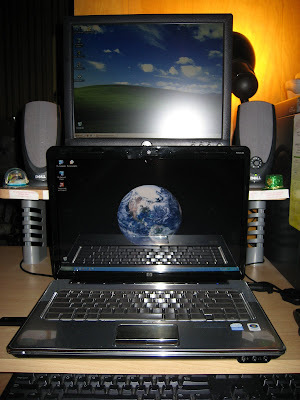 So here is my laptop and the PC I continue to use primarily for playing music since the audio speakers provide a much fuller richer sound than the laptop. Suppose there is a way to avoid the camera flash reflections, but I haven't yet perfected that skill.